I made it to Japan! 日本からのおはよう or Good morning from Japan. I made it! I had Internet problems yesterday when I got here, but have everything working now. Right now it's 7:00 p.m., which means it's very early in the United States. Let me say the trip is exhausting from Baltimore, Md. I was up traveling for over 20 hours. The sun never really went down on the flight and I barely slept; maybe two hours total. The flight was typical: bad food, long and no personal television as I eagerly expected. However, there was a seat between another passenger and I, giving me more room to spread out. Once landed, I grabbed my luggage and picked up my rental cell phone, but it was still another two hours until the Shinjuku Station by a JR train. When I arrived at Shinjuku Station, I had about a ten minute walk to the hotel. This was something I wasn’t really prepared for. Lugging a 50 pound suitcase and a 15 pound shoulder bag with my computer and camera gear through a crowded train stations was difficult. Not to mention parts that had no escalator had some steep steps. But I finally made it. My room had to be changed, too. I am just settling in my new small room. 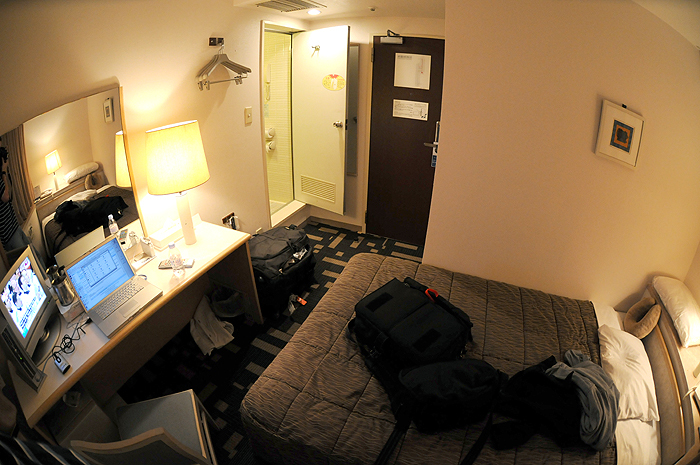 Not sure what the problem was, but Japan hotel rooms really are tiny. Last night I had the air conditioning on “high” and I was sweating profusely. Then I realized this morning that it was heat. Oops. So other than the normal travel troubles and checking in yesterday and again this afternoon, I took a quick shower and met my first guide, Ugi, for some "real" sushi. 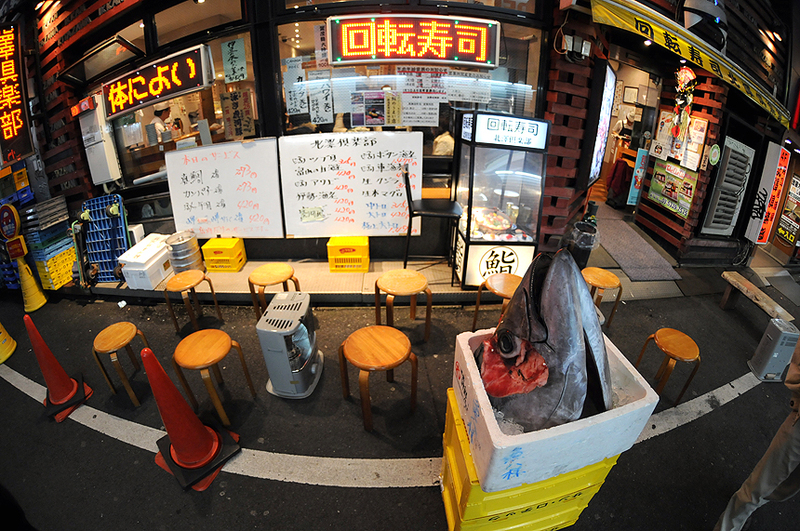 We went to a small (above) restaurant right in Shinjuku. It was a tiny rotating sushi bar, but was excellent; the United States sushi is not nearly as good. I ate everything from sea snake, raw baby shrimp, three types of tuna, red snapper, to salmon eggs and more. Ugi treated and kept telling me to eat more. Ha. After easting, we roamed Shinjuku, so I could become familiar with the area. I finally went to bed around 10 p.m. I slept pretty much through the night, even though my heat was blasting all night. First impressions? The city seems huge, yet very clean. Everything I’ve witnessed is spotless, from each vehicle and taxi that drives down the street to the train station. You could literally eat off the floor the train, too. There are lots of people and it's overwhelming at times; way more than New York city, that is for sure. I was informed it’s the safest city in the world, and not to worry about my safety. There are also bright lights everywhere and makes New York City look uninteresting. 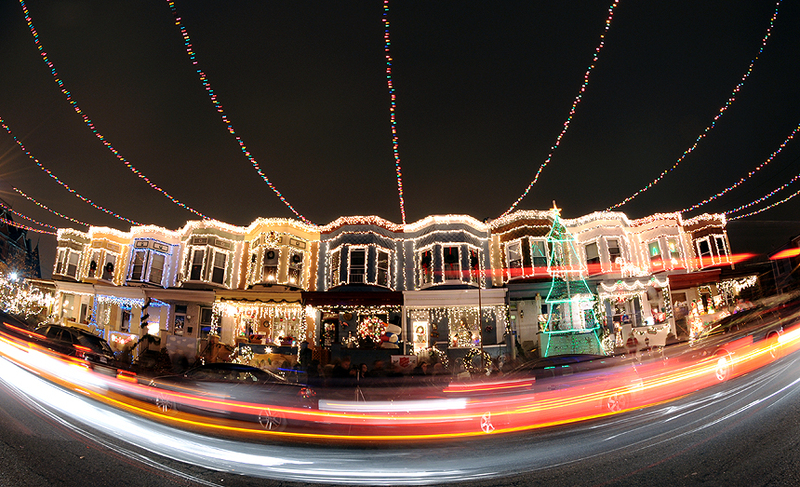 "Cars trickle down the 700 block of 34th Street in Baltimore's Hampden neighborhood as Christmas lights stretch across the road Saturday night. Known as "Miracle on 34th Street" people can make the pilgrimage to the month-long spectacle of lit rowhouses that have been decorating for Christmas since 1989." In case you're not keeping track, I passed a house with an electric sign in their front on my way to Hampden Saturday night reminding passerby only 2 shopping days remain until Christmas. My shopping is done; pockets now empty. Now that I am avoiding all malls by a 30 mile radius and don't have much going on until Christmas Eve, I thought I'd take a trip to see some holiday lights. Earlier this month I missed all the kick-off lighting festivities in Baltimore when in New York. It is raining now, so last night was my only night to check out the well known block of 34th Street in Baltimore's Hampden neighborhood. I am not much for Christmas music, but do enjoy a tasteful tacky spectacle of decorations on a home; just as long as it's not mine. It was also a good excuse to test out my Christmas gift to myself: a Nikon 10.5mm fisheye lens. I bought it mainly for my Japan trip later this month. I doubt I'll use it much for journalism work unless I can get this Fisheye-Hemi program to work. Ugh. Can't. Won't. Let the computer beat me. When younger, I remember my parents driving down the street and then looking at a train garden somewhere nearby. We never actually got out to take a closer look and glad I did tonight. Although this is an image I normally don't shoot, used a tripod which I don't normally use and gazed at Christmas lights which I don't normally do, I appreciate what these folks are doing. I hope they continue the tradition for years to come. WOW. It's late. I hope everyone has a Happy Holiday and Merry Christmas! I am sure I'll be back before the New Year. 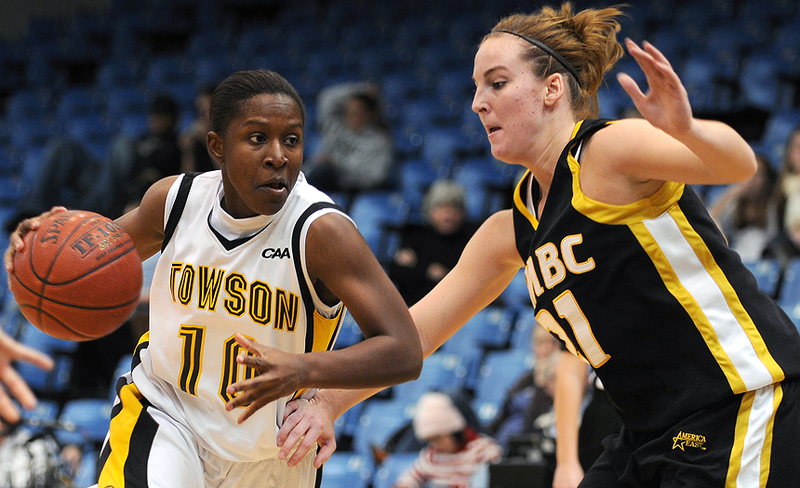 "Towson University guard Alis Freeman drives past UMBC guard Michele Brokans during the second half at the Towson Center, Wednesday, Dec.19, 2007. Towson defeated UMBC 69-61." Go figure. A week after finishing my last exam of the semester in Van Bokkelen Hall at Towson University, I found myself back on campus shooting back-to-back basketball games tonight. From 5:30 p.m. until 9 p.m I was glued to the hardwood floors of the Towson Center documenting the women's defeat over local rival UMBC and the men's overtime loss against Lafayette. My bottom is still sore. Not all was bad. At least my assignments were close to home, something I've shot many times before, I didn't have to fight traffic driving from assignment to assignment and I was in familiar territory. I know my way around Towson with my eyes closed and have my favorite spots on the court to shoot from, knowing what makes the cleanest background. I knew lighting would also be nice, especially with my month old D300's higher ISO. What I didn't know was friend and Towson athletics shooter, Scott Thornton, would not be there using the strobes. In past seasons, I would irritate him continually asking if he would be at each home game, waiting for the one week he wouldn't be there. Since he has first dibs when Kanji is not there, I rarely got a chance to use them. While they aren't perfect, they are nice when trying to cut down high ISO images. However, that is a thing of the past. I now find myself using mainly the ambient light. The D300 is so nice at high ISO and keeping eight frames per second is an added touch. The big lights slow down my shooting, in which I am challenged to release the shutter at the decisive moment. This is something David Hobby talked about when him and I squared up in a friendly battle of college basketball strobing this past February. If you interested in lighting a little high school gym or a big college gym, his article can be found here. My deadline is not until morning, since these will be used for future special basketball sections in the paper. The above is an outtake from my favorite spot on the court and one of the few I shot with the strobes. Got to love empty bleachers at Towson. I am planning on posting a nice Baltimore holiday update before the weekend. Stay tuned. "Dunbar's Tavon Austin is the All-Examiner first team offense Player of the Year for football." 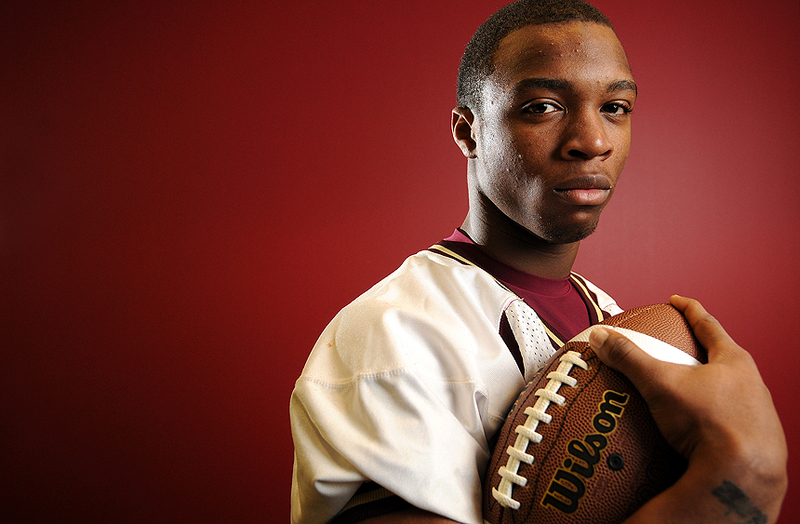 Sunday I helped shoot the Baltimore Examiner high school Fall 2007 Player of the Year awards. I knew I'd be shooting all the individual portraits before arriving early Sunday morning, but I didn't know where I was going to actually shoot them. The weather was suppose to be a nasty winter mix, but turned into just another rain shower. This still prevented me from shooting anything outside. When I first arrived, I helped Chris Ammann setup his backdrop and test his lighting. He would be doing the group shots of: football (offense and defense), boy's soccer, girl's soccer, field hockey, volleyball and boy's cross country and girl's cross country. His job was tough, as there is no real studio and needed to fit 15 or more players on a nine foot backdrop. While he didn't always get all the players perfectly on the seamless, he did come up with another idea. He ran with it and I think it will turn out really cool. I am eager to see the final results. Before he got all the players for the first team group image, I was busy shooting the Player of the Year in each of the listed sports, including the Coach of the Year. Once done, I sent them his way. It was a straight forward task, take waist-up images of a list of players and coaches. But again, I was confined to the Examiner office because of rain. Before firing a single frame I was told: nothing too fancy, nothing crazy with lighting and nothing too extreme with poses. OK, simple enough, but I knew I had to set a theme for the images and make them pop some how. Since there was no more room in the hall, Ammann showed me my room for the assignment. I don't know why, but I originally wanted a white wall. 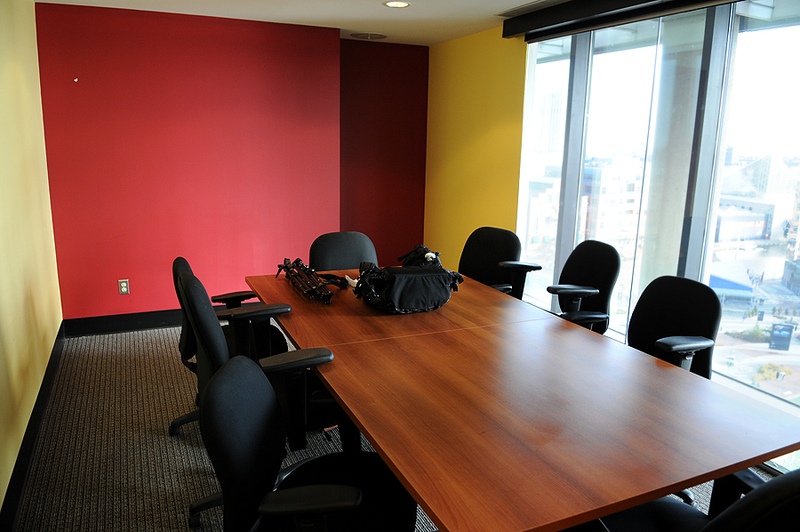 So I totally ignored the colored walls at first. I plopped my two light stands, light bag (consisting mainly of three Nikon SB's and four Pocket Wizards) and camera down on the table and picked up an Examiner from Saturday. Boom. It hit me. The banner is red, why not use that bright red wall behind me? It would not only match the paper's design, but bring a continuing theme to all 15 portraits. I moved the chairs into the hall, pushed back the conference table and setup two lights before finding another pleasant surprise. The paint on the wall was slightly reflective, giving me a nice specular highlight from my front umbrella. The light's highlight also made a natural vignetting effect. After a couple tests and click-wheel turns I knew this would work. What also was nice is I could take my lighting and spin it 90 degrees and get the same effect on the yellow wall. I stuck mainly with the red, but when players from River Hill (yellow and blue school colors) I used the latter. A fun little challenge trying to be different. It's not a typical studio shot, it's not a on location shot (I'd much rather shoot an image on location) and it's not a standard head shot. Lucky for me, each player brought a piece of equipment, too. Whether these are laid out on same page, different pages or on different days, they will be easy to distinguish that they're the fall preview profile images. "New England Patriots head coach Bill Belichick watches quarterback Tom Brady setup the game-winning touchdown against the Baltimore Ravens during the fourth quarter at M&T Bank Stadium, Monday, Dec.3, 2007. The Patriots remain undefeated after winning 27-24." Cheating. Everyone has done it. Everyone has gotten caught at least once. But why do people continue to do it? I remember not doing my homework in high school; copying it from friends who willing let me. It was not a regular act of exchange, but mutual and not forbidden. We didn't get anything out of it, as it was a simple act of just making sure we got our busy work done. This eventually came to a screeching halt when we were caught and found ourseleves sitting face-to-face with the assistant principal. That was, from I can recall, the most trouble I ever got into during my grade school years, and all we got was a slap on the wrist. I try to live a honest, open life. I tell those around me how I feel and expect the same back; good or bad. I don't cheat to get ahead and often fail miserably. So when I see others using means of cheating, it normally confuses me. I always have the quote, "you must fail to succeed" placed in my head. I am always failing at something. But not always succeeding teaches me value lessons everyday. Too many times nowadays children being told they're NOT wrong or have NOT failed. More specifically in sports and school. Parents tell their children they're the best at (enter sport here) and they shouldn't be punished for wrong doings. So this pushes children to cheat to be perfect. But is that right? Children cheating to meet parents high expectations and afraid to be wrong? Of all the people in the world, I am by far no sports reporter or analyst. But when I see reports of professional athletes and coaches allowing cheating it truly is disgusting. 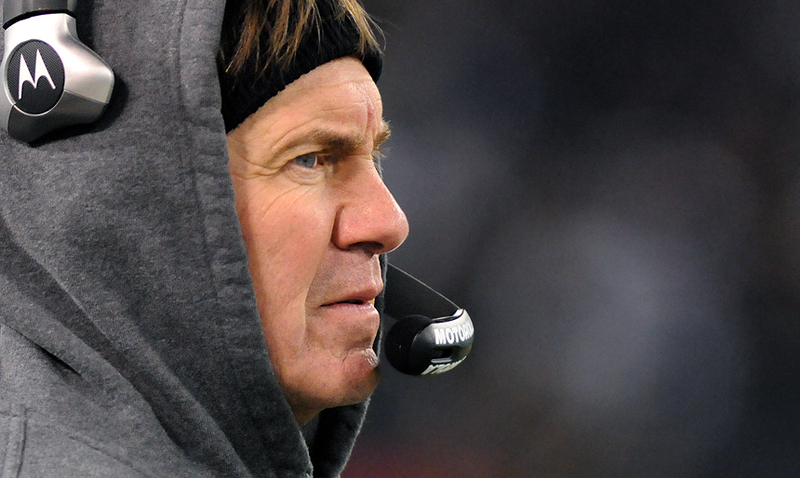 Let's look at the (above) NFL head coach, Bill Belichick. Earlier this year the Patriots were fined $250,000, Belichick was fined $500,000 and the team was forced to forfeit a first round draft pick for the 2008 NFL Draft after being caught videotaping the New York Jets play signals. The Pats, who face the Jets this week, went on to defeat the the Jets in the preseason match that followed the incident. I am unaware of their intentions of filming the signals, but if it was to get a win, they got it. They paid their dues and have since gone undefeated this season. Have they done more videotaping? Who knows. But many are saying there should be an asterisk placed next to their accomplishments much as many are saying with Barry Bonds and his home run record. Any other human living in the United States would be thrown in jail for the use of illegal drugs, so why do major league players get by with just a fine and a week suspension? Why are we looking at these people as professionals? Does cheating make you a professional? This would be to the same degree if photojournalists looked up to those photographers who manipulate photos. And instead of these 'photographers' who are changing facts by manipulating photos getting fired, simply being slapped on the wrist, allowed back to work in journalism and likely to do it again. What if they win a Pulitzer with a manipulated image? Do they allow it? Or do they pull the image and/or stamp it with an asterisk? I am starting to rant, but I guess what I am getting at is why are so many "professionals" looking for an edge over their competitors? Why are they allowed to merely get by only paying sums of money which are surmountable to them? While I may be fighting the fight that will never get solved, I thought I'd share my feelings on the recent topics. I wish these athletes, who are looked up to by many people in the world, especially children, would show that they aren't always perfect. They need to be honest and show that being perfect isn't the perfect answer. Wow, midnight. I should go to bed now. I have an early morning of sportraits before heading to my indoor soccer game, which we, the Green Street Hooligans, are currently tied for second place without the use of illegal videotaping or enhancing drugs. I'd love to hear your feedback on these situations, too. "Skin artist Dave Regan wipes clear excessive ink as he continues to tattoo a crab claw on the arm of Aylen Beazley-Maquehue, of Baltimore, at The Baltimore Tattoo Museum, Sunday, Dec. 2. The parlor walls are littered with American tattoo memorabilia dating back to early 1920." Fifteen days and counting before I head to Toyko, Japan; I cannot wait. I have so many things to get in order and what seems like little or no time to do it all. As previously mentioned, during my trip I plan to blog every night and update frequently to clearly document my adventures. Until then, I will continue to update posts with published freelance assignments. I finished all my exams Tuesday and The Towerlight put out the last issue of 2007 on Monday. It was a very successful year; more on that later this week. The above picture was part of my final project for my Broadcast Journalism course. The project was to make a mini-documentary on a person, place or area in Baltimore using purely audio capture. The project didn’t require photographs, but I opted to incorporate images anyways. I later combined the audio and images using Soundslides since I’ve done in many times before. Don't get me wrong, multimedia projects are awesome and fun. But the project was very different from a photo story, as it needed to be more about the history of the place chosen, in a positive approach. It was not journalistic; it was more or less a public relations piece. It’s hard to explain, so I'll upload it once I get a grade on it. I am afraid if I post it now and my professor hasn't viewed it, I might exceed the bandwidth and crash the site it's placed on. Considering my last podcast got well over 5,000 hits. My experience at this tattoo parlor was not what I eagerly expected. I was planning on hanging out on a busy night, getting great access and remarkable quotes from many sources. But I was told to come in on a slow day, didn’t get many usable quotes, no matter how hard I tried to pull them from sources and my images were OK, no matter how deep I dug to find something different. I don’t know what it was about the shop, but I felt as if nothing went my way. I surely wasn’t treated with the respect I was giving them. From other parlor visits, ink artists aren’t usually the friendliest of people, so I expected a challenge. I don’t have any tattoos; some of my friends are covered in them, so I’ve made many visits to other parlors and witnesed the atmosphere. I never felt the need flaunt a tattoo, the permanent part is daunting. Anyways, not everyone had this off-putting presence toward me, but a couple of them definitely put off a distinct uncooperative vibe. I guess it was when some of them wouldn’t answer me clearly by blatantly mocking or laughing. Conversely, the above tattoo artist was the friendliest employee. He didn’t hesitate to answer any of my questions openly and clearly. He often would elaborate beyond what I needed and made some great quotes, as goes for all the patrons. The shop was also very interesting, displaying tons of history on American electric tattooing. It’s worth a visit if you’re bored on rainy day. Maybe I am being unfair. Maybe I caught some of them on a bad day. Maybe they just didn't like me. Whatever the reason, I felt it was very frustrating when I was unmistakably trying to make the business appear as a pleasant, unique business in Baltimore. It was a difficult assignment, but a good learning experience. "Indianapolis Colts running back Joseph Addai is hit as he falls into the endzone for a 11-yard rushing touchdown in the second quarter against the Baltimore Ravens at M&T Bank Stadium, Sunday, Dec.9, 2007. 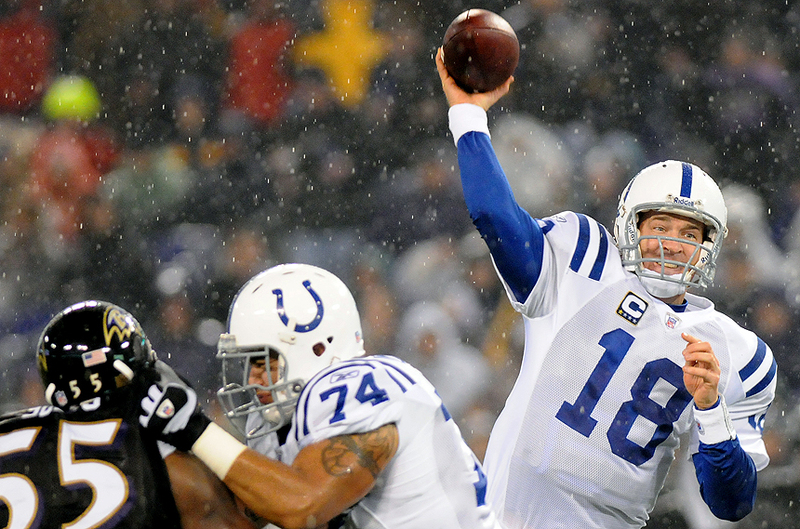 The Colts led 37-7 at halftime." Soggy. Cold. Wet. Three words that describe last nights Ravens game. After driving home from New York Sunday morning, I had just enough time to charge my batteries, format my memory cards and catch a quick nap before heading to M&T Bank Stadium for the game. Coming off a loss last week to the (13-0) Patriots, the Ravens faced another NFL powerhouse team: the Indianapolis Colts. Everyone had their eyes glued to the their computers before the kick off. They were all looking at the radar; the rain was coming. How long until it would actually fall was unknown, but we all geared up for it anyway. The temperature was not as cold as last week, hovering around 40 degrees. But once the rain started to fall late in the first quarter, things just got sloppy. Shooting in the rain has its perks, but tonight was not much fun. Unlike a warm summer rain, tonight was a cold, miserable December rain. Also, shooting in the rain means having a bulky rain cover, which is annoying, especially when it fogs up and you cannot review your images. And if those two things weren't enough to complain about, the game was a slaughter. As miserable as everyone seemed, whether they were a fellow shooter or someone in the disappearing crowd, the game was fairly interesting to shoot. Peyton Manning threw three touchdown passes in the first half and their were a couple good hits. I head in to file my images with three minutes left in the half and never made it back on the field. Chris Ammann and me decided to just hit the road, as we had enough images between the two of us, the game was a blow out (37-7 at halftime) and we'd get beat the traffic. This wraps up my NFL shooting on the year, as I will be in Japan when the Ravens are back in town on Dec.30. I might try to get some more images from the game up tomorrow, but it's finals week. Anyone who has ever been in college or is in college, they know how hectic things get. "Footprints mark the snowy sidewalk as a student makes her way toward the Union garage Wednesday afternoon. The snowfall was the first of the semester and forecasters called for 2-4 inches to be dropped on Towson throughout the day. Sophomore Kanzas Gray said she didn't mind the snow. "I wish they canceled classes, though," she said. "It's a mess and no one likes walking to class when it's cold and slippery."" The last couple days have gone by very fast. So fast that I had no idea that it was going to snow. As I packed up my gear and books this morning I noticed light flurries outside my window. I thought nothing of it. At the Ravens game on Monday it snowed nearly the entire game. Nothing stuck or made a mess of the roadways though. On my commute to class there was still nothing. No snow. The flurries had actually stopped. Fast forward. As I walked to class I noticed the snow becoming steady and sticking, not only to the grass, but to the sidewalks and side streets. Everyone was bundled up and a lot of students had entire snow suits, boots and thick gloves on. Here I was in khakis and a light coat. The minute I walked through the door of my class, I checked the weather forecast. I was in for a surprise. Forecasters called for 2-4 inches to be dropped on Towson throughout the day. I knew right away that: The cover would now be a snow feature, I was going to freeze walking around in less than appropriate attire and my drive home would be a pain, even though I have a Subaru with all wheel drive. I need new tires. Thankfully, I made it home safe. Additionally, I was cold and cover transformed from a construction story to the (above) snow feature. The semester is wrapping up. I just finished a challenging multimedia project and I have two more papers to write by Monday. In the meantime, check back for an update from the Big Apple: New York City. I'll be up there from Thursday to Sunday. I'll be back just in to time for the Ravens vs. Colts game Sunday night.